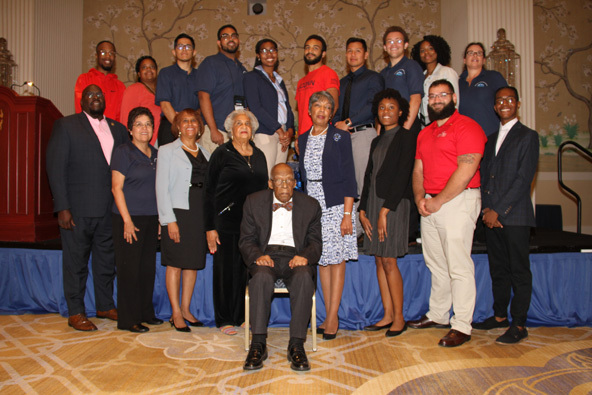 Minority Access, Inc., a 501(c)(3) nonprofit organization that implemented the National Role Models Project in cooperation with 170 colleges and universities, will sponsor its annual Student Researchers Seminars at the Twentieth National Role Models Conference, September 26 - September 29, 2019, at The Gaylord National Resort & Covention Center. Undergraduate students who are conducting research or have conducted research in biomedical sciences or technological areas are invited to present orally their research findings during the seminars. There are two categories of presentations, competitive and noncompetitive, in each area: Biomedical Sciences and Engineering/Technology. Monetary awards totaling up to $10,000 - will be presented to outstanding students presenting competitively. Student researchers are provided a platform to share their research findings, enhance their presentations skills, and/or receive guidance from seasoned researchers, mature scholars, and their peers. In addition to monetary awards for competitive presentations, Minority Access will distribute summaries of exemplary research presentations to research departments of pharmaceutical and/or high tech firms. Seminar sessions will be held Friday, September 27 and Saturday, September 28, 2019. Awards will be presented on Sunday, September 29, 8:00 AM - 11:00 AM. Student researchers are expected to register for and attend the 20th National Role Models Conference to participate in the Student Researchers Seminars and must be present to receive cash awards at Student Researchers Award Presentation on Sunday, September 29, 2019. We are inviting undergraduate student researchers to participate in our student researchers seminars at Minority Access' 20th National Role Models Conference. Student researchers will make oral presentations and are encouraged to use Microsoft PowerPoint. Abstracts will be accepted via electronic submission only and must conform to the abstract submission guidelines. Student researchers are expected to register and attend the 20th National Role Models Conference to present their research and findings. Deadline: All abstracts must be received by Minority Access, no later than 5:00 PM Eastern Time Wednesday, September 18, 2019. Eligibility: All research should be representative of biomedical sciences and/or engineering/technology. Presentation Format: Researchers will make oral presentations using Microsoft PowerPoint to enhance it. Researchers will be given up to 10 minutes to present their research findings and up to 2 minutes for questions and answers. Click here for a complete list of tips and guidelines (.pdf).  Maximum of 275 word count (excluding title, authors, institutions, and mention of grant support). Define all abbreviations the first time they appear in the abstract.  Single space all typing except for double space between title and body or between paragraphs.  Use a 12 point font, preferably Times New Roman.  Proofread the abstract carefully before submitting to avoid corrections.  Submit abstract electronically via the Online Student Research Form. ·	Abstract - approximately 275 words. ·	Student biography and resume - 50 words or less in third person format. 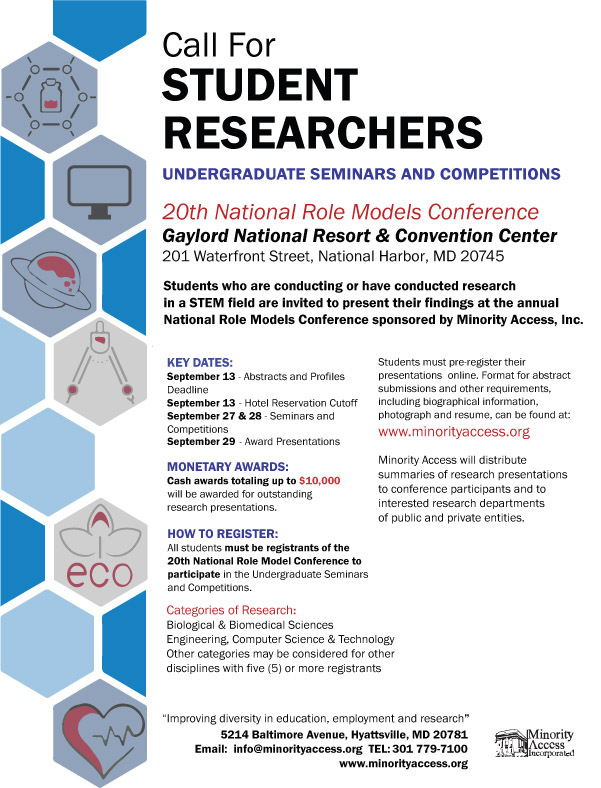 ·	E-mail to info@minorityaccess.org, subject line: "Researchers Competition: Photo"
�	Student researchers are expected to register and attend the 20th National Role Models Conference to present their research and findings. Conference Registration may be submitted electronically via the Conference Registration link.